September’s San Diego real estate market in review: As of September 2017, the median detached home in San Diego County sold for $610,000 up 5.4% from the previous year. As of September 2017, the median attached home (including condos, townhomes, and twinhomes in San Diego County sold for $415,000 up 10.7% from last year. The average detached home in San Diego spent 18 days on the market. 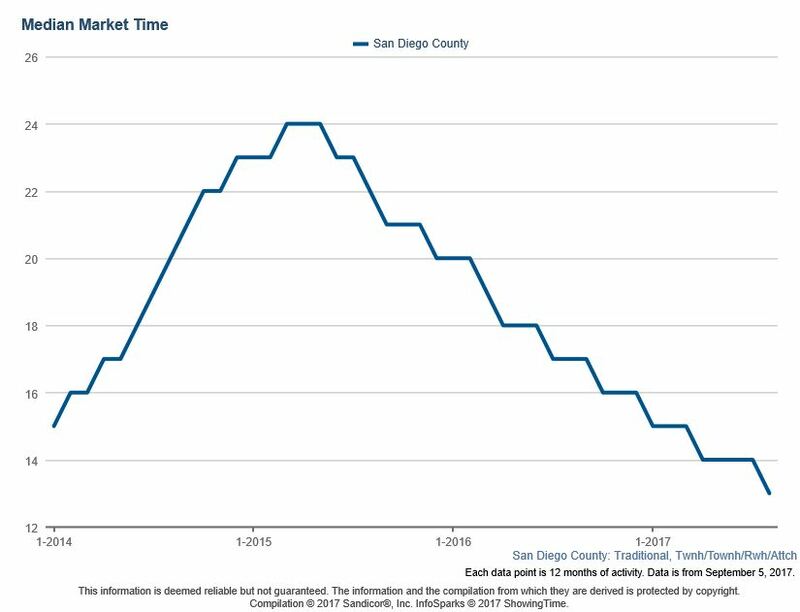 Condos, twinhomes, and townhomes in San Diego spent an average of 13 days on the market. 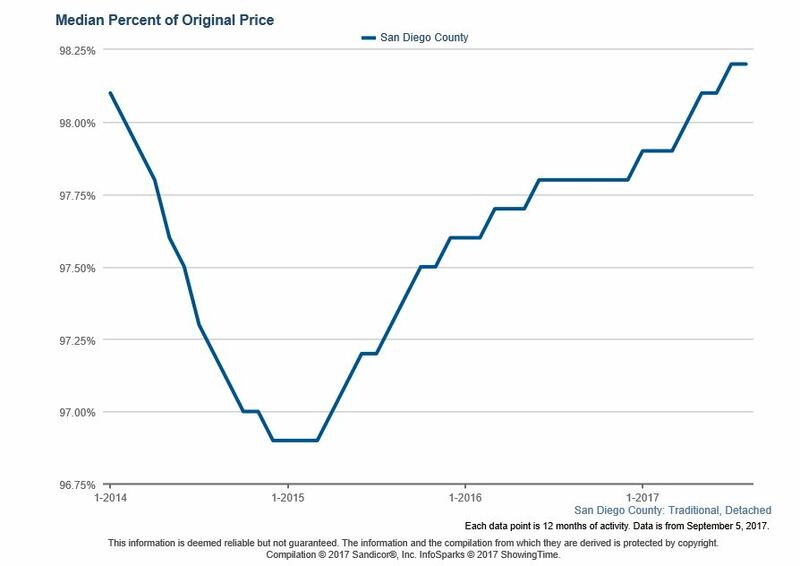 As of September 2017, the average seller of a detached home in San Diego County receives 97.2% of the original list price at the close of the sale. As of September 2017, the owners of attached properties (condos, twinhomes, and townhomes) retained 98.4% of the original list price. 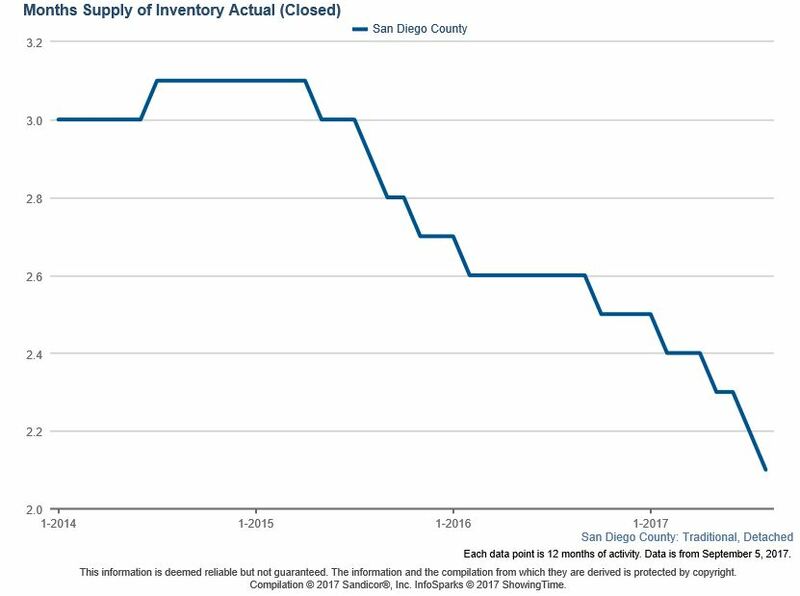 The inventory of homes in San Diego County is still low, which is consistent with what we know that inventory is very tight and not predicted to dramatically improve as we move into the comparatively slower fall and winter seasons. August’s San Diego real estate market in review: As of August 2017, the median detached home in San Diego County sold for $595,000, up 7.2% from the previous year. As of August 2017, the median attached home (including condos, townhomes, and twinhomes) in San Diego County sold for $390,000 up 6.8% from last year. As of August 2017, the average seller of a detached home in San Diego County receives 98.2% of the original list price at the close of the sale. As of August 2017, the owners of attached properties (condos, twinhomes, and townhomes) retained 98.9% of the original list price. July’s San Diego real estate market in review: As of July 2017, the median detached home in San Diego County sold for $582,000, up 6.8% from the previous year. As of July 2017, the median attached home (including condos, townhomes, and twinhomes) in San Diego County sold for $385,000 up 7.5% from last year. 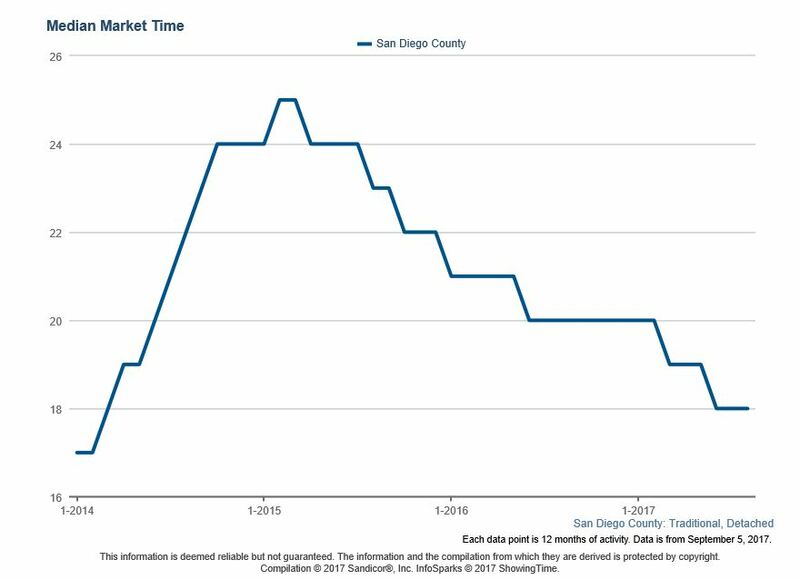 The average detached home in San Diego spent 19 days on the market. Condos, twinhomes, and townhomes in San Diego spent an average of 15 days on the market. As of July 2017, the average seller of a detached home in San Diego County receives 98.1% of the original list price at the close of the sale. As of July 2017, the owners of attached properties (condos, twinhomes, and townhomes) retained 98.9% of the original list price. 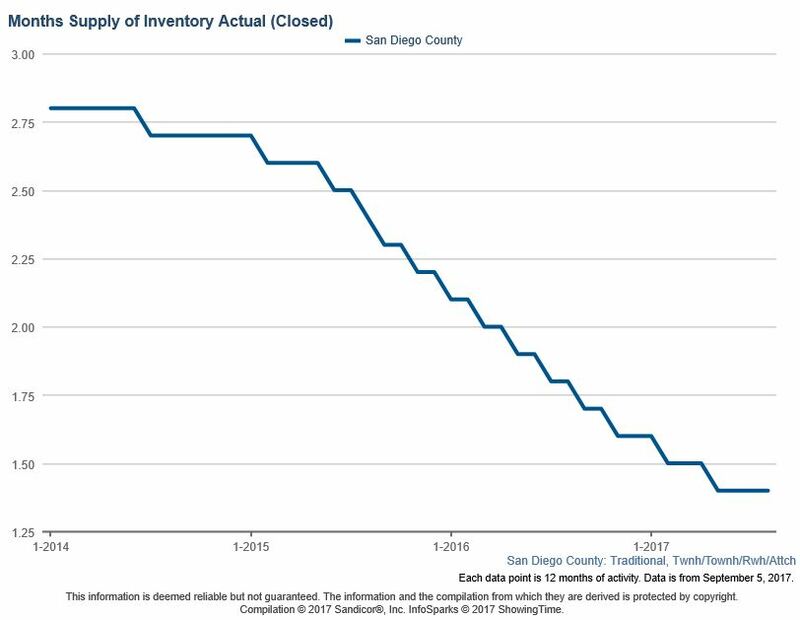 The inventory of homes in San Diego County is still low, which is consistent with what we know that inventory is very tight and not predicted to dramatically improve. June’s San Diego real estate market in review: As of June 2017, the median detached home in San Diego County sold for $586,000, up 6.5% from the previous year. As of June 2017, the median attached home (including condos, townhomes, and twinhomes) in San Diego County sold for $387,500 up 7.6% from last year. 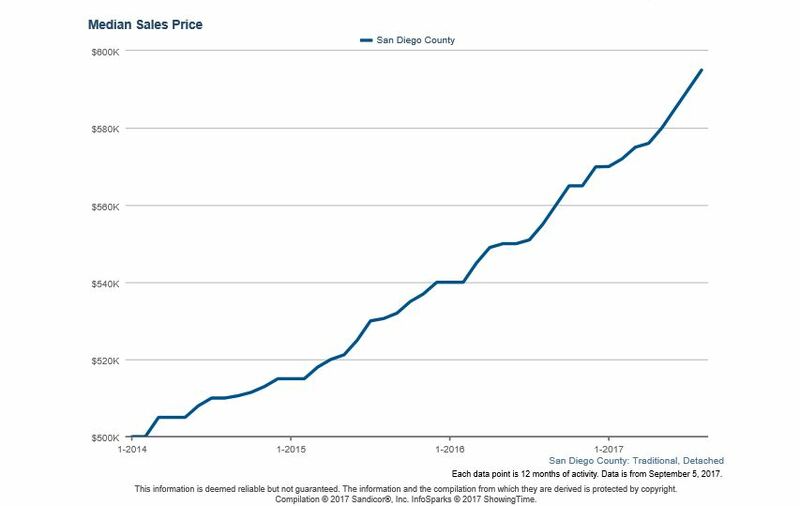 Condos, twinhomes, and townhomes in San Diego spent an average of 14 days on the market. As of June 2017, the average seller of a detached home in San Diego County receives 98% of the original list price at the close of the sale. As of June 2017, the owners of attached properties (condos, twinhomes, and townhomes) retained 98.8% of the original list price. Enjoy the Pacific Ocean Lifestyle year round in this ocean view contemporary. New carpet and a fabulous new price add to the enticement of this living dream. Guests will love the kitchen / great room combination while gazing out over the ocean. The great room has a ceiling designed to entice the architectural eye with windows opening to over 500 sqft of private rooftop deck. From the private rooftop deck you can take in the day from the comfort of the master suite. Sold for $2,400,000. You’ll love the panoramic ocean views and sunlight that fills this spectacular home. This Herb Turner architectural gem, located in a small enclave of 10 homes in Olde Del Mar, is a short distance to the village and beaches. Many beautiful features throughout the home including vaulted ceilings and abundance of windows. Spacious bedrooms with balcony’s for enjoying the beautiful views, your morning coffee or adult beverages! Private courtyard patio in the backyard. Sold for $2,124,000. Experience the feeling of a destination vacation every day in this immaculate former model home. Elevated on a corner lot on a cul de sac, at one of the highest elevations in the Crosby, the property features 4 bedrooms, including the sumptuous Master suite with fabulous terrace and peek ocean views, office with custom built ins, a bonus room, & lavish entertaining spaces indoors and out. The professionally landscaped grounds accent the true beauty of the Mediterranean inspired architecture. Sold for $1,867,000. Absolutely BREATHTAKING, ONE OF A KIND showpiece in the desirable, gated community of Balearas, La Costa Greens. This home is an entertainers dream. Remodeled inside w/ new cabinets & granite in kitchen & all new bathrooms, new wood flooring, paint, shutters & much more! Master suit w/walk out deck & large closet. Bonus rooms include granny-flat w/separate entrance, extra bdrm/bath &steam-room w/entrance from pool.The backyard is highlighted by the pool/spa, covered bar, putting green & spectacular views! Sold for $1,899,000. Stunning views and privacy from this well appointed executive semi-custom home in The Lakes Above RSF! Lives like a single story with a downstairs master suite, 2 ensuite bedrooms & a private upstairs suite perfect for family or guests. Pristine condition and move in ready with an open concept great room, gourmet kitchen with prep kitchen, top of the line hardwood and marble floors. Entertain in style in the huge yard w sparkling saltwater pool/spa, CA room, outdoor kitchen & cozy pergola. Top PUSD! Sold for $1,750,000. “Under Construction” South Facing Ocean Views captivate your imagination upon entering the “Spanish Ranch ” Home with over 4,800 Sq. ft. This finely appointed home features a ground floor master suite, office. It’s highlighted by a center courtyard with fireplace, two en suite bdrms & upstairs media rm. A fourth en suite bedroom and junior master suite, with separate entrance, complete the second floor living area. Pictures of the Model. Estimated completion 05/31/2017. Sold for $1,740,000. UNBELIEVABLE, PREMIER, ELEVATED LOT w/OCEAN & LAGOON VIEWS from this FORMER MODEL in desirable LA COSTA OAKS! Enjoy the ultimate indoor/outdoor California living w/panoramic doors, FIRST FLOOR MASTER, double volume ceilings & a wide open floor plan! The chef’s kitchen boasts Bosch SS appliances, custom counter to ceiling backsplash, quartz countertops & large island w/breakfast bar. Sit & enjoy the peaceful sunsets from your immaculate & bkyrd w/fire pit & BBQ! 2 community pools & more! Sold for $1,599,900. Located in gated community of Mirasol on large corner lot. Beautifully surrounded by tropical & lush landscaping & features resort style pool/spa, outdoor BBQ & firepit to enjoy! Largest floor plan includes downstairs en suite, bonus room upstairs, master retreat & guest casita with separate entrance. Gourmet kitchen features oversized center island, commercial grade stainless steel appliances & butler’s pantry. Large wine room off dining room – perfect for wine collectors. Sold for $1,475,000. Beautiful home in the highly desirable and private gated community of Tiburon. 3 plus bedrooms, downstairs master, downstairs office, den and 4 full bathrooms. Wainscoting, crown molding, custom built ins and premium upgrades throughout. Tons of natural light. Wolf range and double oven, sub zero refrigerator and pot filler above the range. The backyard is an entertainers dream with large outdoor fireplace, outdoor cooking area with BBQ and a 12 person oversized built in jacuzzi. Sold for $1,429,000. Centrally located in the prestigious gated community of Santa Monica in Santa Luz, this beautifully upgraded executive home is move in ready! Elegantly appointed with many custom features and a private backyard oasis w/salt water pool/spa, built in bbq island, cozy fireplace & views of the mountains. The large open floorplan offers single story living with all bedrooms on the main floor and an upstairs master bedroom retreat. Gorgeous remodeled kitchen and baths with top of the line finishes! Top PUSD! Sold for $1,365,000. If you’re looking for a large, private backyard w/sparkling pool in highly sought after LA COSTA OAKS, THIS IS IT! This home is beautifully upgraded with custom paint, plantation shutters, crown molding, 3 fireplaces & much more! There is a full bedroom suite PLUS office on the 1st floor! Gourmet kitchen w/butler’s pantry, vegetable sink in the center island, stainless steel appliances including a double-oven and five-burner cook-top, plus granite counters & an abundance of cabinet space. Sold for $1,350,000. Stunning single story in immaculate condition located on cul-de-sac! This floor plan wraps around a center courtyard w/4 sets of French doors & outdoor fireplace – perfect for entertaining along w/backyard pool & spa! Plantation shutters, crown molding! Gourmet kitchen – a chef’s dream w/top of the line stainless steel appliances (Thermador), 2 Bosch dishwashers, oversized center island, large walk-in pantry & adjoining eat-in area w/built-in buffet! Sold for $1,329,000. Santa Barbara!! The minute you drive through the main gate, you know that you have arrived HOME. Ideal layout with all spacious four bedrooms on 2nd floor and one bedroom on 1st floor. Large windows throughout the house keeps this place light and cheery through all seasons. Open gourmet kitchen with huge island for family gatherings, walk-in pantry, upgraded appliances. French door to backyard patio is perfect for entertaining. Expansive Master’s suite has sweeping easterly views. Sold for $1,320,000. Gorgeous executive single level home in The Lakes above RSF a gated private enclave close to all. Open concept home w/ gourmet-dream kitchen w/upgraded cabinetry, granite counters, SS appliances, custom backsplash, huge breakfast counter, walk in pantry and hobby room/office. Features crown molding, surround sound, oversize laundry room and gorgeous hardwood floors. Entertain in your outdoor CA room or enjoy a dip in your salt water pool/spa. Includes guest suite w kitchenette & w/d hookups. Top PUSD. Sold for $1,305,000. TURN KEY opportunity! Stunning Plan 3 Bordeaux.5 bed,3 baths w/ full Bed/Bath downstairs.Custom paint,wood shutters.Nice size south facing yard,custom built in BBQ,fire pit &spa.Formal dining & granite counters in gourmet kitchen.A/C. Fireplace in LV & FM room.Lower mello-roos & HOA,walk to Sycamore Ridge Elem.Top rated middle & high schools near by.Community Center features pool, spa,clubhouse,exercise room.New shopping center-the Village close by.Easy to 5 & 56. Sold for $1,275,000. Elegant executive home in gated Bridlewood Country Estates w lovely views of the mountains & a private oversized backyard w pool/spa. Fully remodeled this gourmet kitchen features cherry hardwood cabinetry, granite counters, large center prep island, top of the line appliances. The upstairs includes 2-oversized bedrooms plus a large master suite w/private balcony to enjoy the views! A convenient full br/ba on main level is currently used as an office. Close to schools, parks, golf. Low HOA, no Mello Roos! Sold for $1,275,000. Lovely home in one of Carmel Valley’s most coveted neighborhoods! Features include elegant entry, charming living room w/fireplace, dining room w/French doors, wood floors, neutral tones thru-out, remodeled kitchen w/center island & bedroom with full bath on main floor. The exterior has wonderful curb appeal & spacious yard w/pool & spa. All this Plus one of the best locations in Carmel Valley w/ just a short distance to the best it has to offer, top schools, beaches & jump on I-5 in minutes! Sold for $1,260,000. Prepare to fall in Love!! Gorgeous executive home in the highly desired community of La Costa Valley. This home has been updated with new flooring, paint, carpet, hardware, toilets, remodeled powder room and enhanced landscaping. Much sought after floorplan that includes a downstairs en-suite bedroom/bath. This sophisticated home sits on an elevated, private, view lot located on a cul-de-sac street! Turn key, Solar System, shutters, & security! Separate Master Bedroom retreat could also be a 5th bedroom. Sold for $1,194,500. Mello Roos has been partially paid off. Spanish style Architecture in 4S Ranch with front porch makes this 5 bedroom 4 bathroom popular. Home includes many upgrades such as Granite kitchen counter tops, upgraded interior home wiring, upgraded stained, wrought iron stair handrails and stainless steel appliances. Large landscaped backyard with patio, gazebo and fountain. Sold for $1,148,000. Elegant single-story home in the Haciendas at Rancho Carrillo. FORMER MODEL HOME loaded with gorgeous upgrades! 13,031 square foot lot with tremendous privacy and oversized in-ground spa. Custom built-ins throughout, central air conditioning (zoned), central vacuum, four fireplaces. Den configured as office with built-ins. 3-car garage, central courtyard with fireplace, large laundry room. Gourmet island kitchen opens to family room. Sold for $1,095,000. Rarely found single level home in Scripps Highlands. Open floorplan with 3 bedrooms + a den, 2.5 baths and 2612 square feet. Generous living spaces with beautiful finishes and abundant storage. Granite countertops, double oven, custom paint, newer carpet, solar-heated, saltwater pool with a waterfall and a slide, a spa and a built-in BBQ. Home has a walk-in pantry, gas fireplace, beveled windows, oversized master bath, a 3-car garage, and is in meticulous condition. Must see. Sold for $980,000. Private cul de sac location in Park Village with large resort like backyard including a solar pool/spa, outdoor kitchen & grassy area for kids to play. Parklike views of the gorgeous landscaped backyard and peek views of the canyon. Beautifully remodeled kitchen with new cabinets, granite counters, SS appliances. Features large walk-in pantry, newer porcelain tile floors on the main level with hardwood floors upstairs. Convenient downstairs bedroom and bath. Top PUSD. No HOA & soon to expire Mello Roos! Sold for $975,103. Situated in ideal location of St Andrews with DOUBLE views – scenic mountain views from the front and golf course views in back. Enjoy the views including the beautiful lush landscaping from almost every window in the home! Open spacious floor plan with multiple skylights create a light & bright atmosphere! Relax or entertain in backyard (facing 6th Tee) with custom paved patio areas & Zen pond to enjoy! Sold for $975,000. Absolute Charmer just 1 block up from Morley Field. Perfectly situated on a large lot sitting on the high east side of the street w/tons of curb appeal & privacy. Interior features & improvements are all in-line with the Craftsman style; lovely hardwood floors, spacious room sizes, built-in cabinetry, french doors, remodeled kitchen, period lighting & so much more. Outside enjoy lush setting with beautiful trees & raised veg beds, all perfect for tranquility or entertaining. This one has it all! Sold for $949,000. Great opportunity! 4S Ranch Legacy situated on a cul-de-sac street with 4 bedrooms and 3.5 baths. Wonderful floor plan with lots of light, Spacious kitchen with center island, lots of cabinetry all open to family room, large upstairs laundry & more. Enjoy backyard not backing to roads or power-lines, 3 car garage, top rated Poway schools and wonderful location close to all the best 4S Ranch has to offer! Sold for $901,000. Rare single story on cul de sac w large private lot and no road noise. Spacious open floorplan with vaulted ceilings, French doors leading to patio, updated kitchen with granite and S/S appliances. Features hardwood floors in all but 1 bedroom, decorator paint and 4″ baseboards. Convenient indoor laundry room, central A/C & 2-car attached garage. Walk to award winning Torrey Pines High and Carmel Creek Elementary. Close to parks, schools, shopping, & 5 min to beaches. Low HOA/Mello Roos soon to expire! Sold for $896,000. Back on Market at no fault of the property. This beautiful 4 bedroom Del Sur home is turn-key and beautifully upgraded. Wood floors throughout the lower level perfectly compliment this open floor plan. After a long day, relax by any of your 3 fireplaces or soak in the jacuzzi tub in your master retreat. In addition to the multitude of upgrades and amenities within the home, the house is located a half block away from two parks, a playground, and two pools. Sold for $889,000. Function meets elegance in this stunning home with breathtaking canyon, mountain & city light views. Desirable floorplan boasts downstairs office/optional bedroom w/ full bath, formal living/dining rooms w/ dual sided fireplace, & upstairs loft. Huge kitchen offers large center island w/ quartz countertop, rich stained cabinetry, custom backsplash,stainless steel appliances, & walk-in pantry. Huge Master suite w/balcony overlooking the lush backyard w/ built-in BBQ, firepit, & spa. Award Winning Schools. Sold for $879,000. Absolutely gorgeous, high end quality, master craftsmanship built home located in the rolling hills of Fallbrook. Enjoy panoramic views from the open design of this single story home with double bi-fold doors leading out from the great room/kitchen area to the quiet countryside views. This is CA living at its best! Entertainer’s dream kitchen with custom cabinetry, luxurious slab Carrara Marble counter tops and top of the line appliances. Sumptuous master suite is truly a retreat in itself… Sold for $873,747. Don’t miss this highly desirable, seldom available Canyon Ridge home in Carmel Valley. It’s all about LOCATION. Plan 4 model on corner lot, 1859 Sq. Ft., beautifully upgraded and maintained. Lower level has gorgeous hardwood and ceramic tile floors. Kitchen just upgraded with new appliances. Large upstairs master suite and bath with spacious walk-in closet. Cozy private patio with room for BBQ and table seating for six. This beautiful home is ready to move in and enjoy. Sold for $870,000. Terrific family home in Sausalito at Torrey Hills. This 3 bdrm home w/ huge loft (easy 4th bdrm option) is bathed in sunlight and located in a quiet part of the neighborhood. Upgraded over the past few years, features include: new interior paint & carpet; hardwood floors; granite countertops & refinished cabinetry in kitchen; newer water heater; custom linen closet built-in for ample storage; alarm system. Walk to elem school & park. Acclaimed DMUSD & San Dieguito schools. Easy freeway & beach access. Sold for $855,000. Open spacious floor plan features formal living and dining rooms. Crown molding, tile flooring, neutral paint. Gourmet kitchen features stainless steel appliances, center island with eating bar & adjoining eat-in area. Large master suite features fireplace, dual walk-in closets & spacious bath w/soaking tub, separate shower enclosure & private balcony. Conveniently located upstairs laundry room. Central air, security system. Walking distance to community pool, spa, playgrounds, walking paths & more. Sold for $847,500. Nestled on a tranquil cul-de-sac in the highly desirable neighborhood of Mariner’s Landing in San Elijo Hills, this home boasts true pride of ownership inside & out! Step inside a welcoming & flowing open floor plan featuring tons of natural light, custom upgrades, 4 full bath, entry level bed w/ ensuite bath, optional room, 2 balconies, spacious master & more! Expansive and private lot offers room for a pool & endless possibilities for entertaining with outdoor kitchen, fire pit & waterfall. Sold for $827,000. Great School District – No HOA – No Mello-Roos – One of four spec homes built by developer that are not part of The Colony HOA. In ground pool/spa. Surrounded by larger homes. Almost .5 acre lot. Sold for $820,000. Charm exudes from this four-bedroom 2.5 bath home inside and out! Great floor plan with recently installed wood laminate flooring on the main level, lovely French doors in family room & living room, newer interior doors & hardware, stunning master bath remodel with extra cabinet built-in, A/C, newer windows & roof. Outside enjoy Lush Landscaping, spacious amount of grass and a beautiful garden feel, great for entertaining or family enjoyment. This home is a winner and won’t last! Sold for $780,000. Come see this amazing panoramic view lot. Lot has been cleared and ready for you to build your dream home with sweeping backcountry views. Set at the end of a cul de sac, this lot has the potential to become a private oasis. Home on this street recently sold for 3.285M with similar view and lot size. One of the few lots in Encinitas with such a spectacular view and so close to top rated schools and shopping. Hidden gem, waiting to be developed! Sold for $770,000. BEAUTIFUL SEVILLA HOME IN COVETED SCRIPPS RANCH! Located on quiet street with private back yard yet close to all including Jerabek Elementary, Scripps Racquet Club, Lake Miramar, Parks, Shopping, & easy commute to freeways. Enjoy beautifully upgraded gourmet kitchen with all new appliances, Jennair cooktop, convection oven, granite counters, cherry wood cabinets, travertine backsplash, upgraded tile flooring, recessed and under cabinet lighting. New pergola and much more! NO HOA or MELLO ROOS. Sold $735,000. Location…Location…Location. This recently updated and upgraded, single level floor plan, located near the end of a quiet cul-de-sac, in desirable Montelena neighborhood, is also “move-in ready.” Wonderful floor plan with numerous upgrades recently completed. **See supplement** Back yard includes sparkling pool/spa and built-in BBQ …great for entertaining. Drought resistant landscaping has just been installed both front and back lowering maintenance costs. Award Winning Poway School District. Sold for $718,000. Enjoy the privacy of this rarely available end-unit townhome on a premium lot over-looking the pool! This home is move-in ready and offers an open-concept great room. The stylish solar powered highly energy efficient “green” townhome significantly reduces your utility bills. Close to shopping, dining, entertainment, Alga Norte Park and award winning Carlsbad schools. Sold for $679,000. This beautiful, bright home enjoys a panoramic westerly view, walkable neighborhood, and open FP with vaulted ceilings. The gourmet kitchen boasts black granite, stainless GE appliances & dine-in island. 1st floor bedroom & full bath is perfect for seniors/guests! Large master suite with dual closets & vanities. Soak in the sunset & hot air balloon view from your backyard, with large patio & lawn. Enjoy family friendly Feather Ridge: easy fwy access, shopping, YMCA, library, top schools & dog park! Sold for $665,500. Charming condo in Carmel Valley. Located on the 2nd floor, this corner unit offers privacy unlike any other. Perfect in every detail and ready to move in! Crown molding, recessed lighting, granite countertops, open floor plan, 2 large secondary bedrooms. Master bedroom w/ensuite bath, walk in closet, and views. View deck for bbq. Large Washer/dryer. Located across from the clubhouse & pool. Walk to Solana Pacific, CV middle school, shopping, restaurants, theater, parks & more. Attached garage + 2 spaces! Sold for $650,000. Located 1/2 mile to the beach! Beautiful townhome (1 of 4) in small complex w/attached 2 car garage. Immaculate & move-in ready! Upgraded kitchen features granite counter, stainless steel refrigerator, pantry closet & adjoining eat-in area. Indoor laundry closet w/brand new washer & dryer. New windows & sliding door installed 2016. Large master bdrm w/private balcony, vaulted ceiling, walk-in closet & upgraded bath. Large secondary bedroom or 2nd master also features private bath & walk-in closet. Sold for $625,000. Beautiful 2 bedroom Townhome w/ 2 car attached garage in University City with excellent walk score. Private back patio for entertaining and front porch to sit out and enjoy the outdoors. 2 Large masters w/ en-suite bathroom vaulted ceilings and skylight on staircase. Freshly painted & brand new carpet upstairs. Vista La Jolla is a resort like community featuring 3 pools & spa, tennis courts & clubhouse. Award Winning Schools. Minutes to mall, shops, restaurants, movie theater, fwy, & beaches. Great Urban townhome in highly desirable Mission Florence w/great location on border of Mission Hills & Hillcrest. Spacious/open interior with wood floors, high ceilings, dual masters (one upgraded w/ CA closets) and designer fans, dual-pane vinyl windows, 2 car tandem/secure garage plus 2 storage closets (owners paid for second large unit)! Very connected HOA with only 18 units, steel & concrete construction provides quiet interior . Walk out your front door to restaurants, bars, coffee shops & more! Sold for $605,000. Unique end unit with extra windows overlooking a wide tranquil promenade. No one above nor below. Dual master bedrooms plus a “media room” that makes a great home office. Convenient attached two car garage. Beautiful central kitchen features a huge granite island, granite counters, and stainless Whirlpool appliances. Nicely maintained; always owner occupied. Andalucia is a peaceful, upscale, townhome complex. Ideal central Carmel Valley location close to phenomenal schools, shopping, & beaches. Sold for $596,000. Single story home with open floor plan and a lot of natural light. Spacious living room & dining area with fireplace & laminate floors. Kitchen has granite countertops & stainless steel appliances. Sliding doors in master bedroom & family room lead to covered patio/backyard with no neighbors behind & is great for entertaining! Enjoy the amenities the community offers: playground, sparkling pool, spa, tennis & basketball courts. Close to schools, dining, parks and easy freeway access. Sold for $582,500. Beautifully upgraded spacious single level home. New wood like laminate flooring and paint. Stainless steal appliances and granite countertops. Tile in kitchen and baths. Master Bedroom and 2nd bedroom both have walk-in closets. Both bathrooms are roomy and upgraded. Attached tandem garage has a nice area for storage. Close to shopping, entertainment and restaurants. Sold for $570,000. Stunning home, totally remodeled…Wonderful views in all directions… Quality vinyl windows throughout…Bedroom and full bath downstairs…Baths remodeled with granite counters & travertine floors…All newer cabinets and stainless appliances + granite counters in kitchen…The laminate flooring that is throughout the home makes for a truly luxurious feeling..The refinished fireplace features stone, & is quite special. Home is located on a deadend cul-de-sac street… You need to see this home quickly. Sold for $560,000. This wonderful 3 bedroom 1 bath home features new exterior paint and a new roof. New dishwasher and new microwave. There are double pane windows and sliders throughout the house. It also features an updated AC/heating unit. The new skylight brings lots of natural light into the bathroom. In the yard, there are several fruit trees including lime, tangerine, apple and orange. Great central location in the Poway Unified School District! Sold for $555,000. Welcome home to Scripps Ranch! Lovely remodeled two-story town home in move-in condition! Filled with Natural light & an Open Floorplan. Remodeled Kitchen with Quartz Counters and Stainless Appliances. Features include newer laminate flooring and carpet, designer paint, two fireplaces, air conditioning, a large balcony with a classic Scripps Ranch Treeline View & Inside Laundry. Spacious back patio connects to a two car garage with extra storage. Walk to Scripps Ranch Swim Club & Award Winning Schools! Sold for $550,000. Wonderful single level house on huge lot. Enough room for your RV and toys. Oversized 3 car garage. Great open floor plan. Sold for $522,500. Large corner unit with dual master living. Upgraded kitchen, bathrooms and bamboo flooring. This open and bright unit provides a nice breeze and is off the main road, providing an exceptional location. This is the largest floor plan in the development and has great amenities that include a pool, gated entry for security and underground tandem garage parking close to the elevator for easy access. Near all restaurants, shopping, easy freeway access and public transportation. Walk to it all! Sold for $493,000. Beautiful 2 bedroom, 2.5 bath townhome in desirable 4S Ranch. Immaculate condition. Open flowing floorplan features elegant wood flooring on main level, upgraded cabinets, great kitchen, custom paint throughout, convenient upstairs laundry room and 2 garage spaces (1 attached and 1 detached.) Award winning Poway Unified schools. This lovely home is walking distance to Monterey Ridge Elementary, parks, library, shopping and restaurants. Must See. Your client will fall in love! Sold for $486,000. Immaculate townhome features hard wood floors in the main living area, new carpet in both bedrooms, and a spacious master bedroom with en-suite bathroom and walk-in closet. This is a wonderful opportunity to own in desirable Canterra complex that is close to shops, casual dining and top-rated Scripps Ranch Schools (Dingeman Elementary & Marshall). Includes A/C, Low HOA, No Mello Roos, Close to 15 FWY. Located in the interior of the complex near the beautiful community pool/spa, playground, BBQ, and park. Sold for $470,000. Nearly waterfront with expansive view of Lake. Only the bluff comes between this condo and the Lake. Very private, end location. This 2-bedroom plus den/office, 2 bath condo has been updated with new paint throughout, corian counter tops and newer cabinetry in kitchen, new light fixture in bath 2, 2 patios and 2 garages. Beautiful laminate wood flooring in kitchen and baths. Gas fireplace in living room. Walk-in closet, walk-in shower and large tub in master bath. Short walk down the street to pool. Sold for $464,000. This picture-perfect Saratoga townhome shows like a model! Brand New Stainless Steel Appliances in the Kitchen. Plush Brand New Carpet Throughout. Brand new Custom Paint Throughout. Wood floors in the kitchen and entryway with tile in the baths. 2 Large Bedrooms with the Master having 2 Closets. Upstairs Laundry with Washer & Dryer Included. Also Includes a 1 car attached garage and a parking pass for an additional vehicle! Sold for $461,000. This beautifully updated single level home enjoys a prime location on a quiet street. Step into a bright, open floor plan with vaulted ceilings & incredible tile. You’ll love the gourmet kitchen boasting new stainless appliances & beautiful wood cabinets, with great entertaining spaces all around. 4 bedrooms are spacious & bright. Large, private wraparound yard for the whole family to enjoy! Desirable central location has easy fwy access & shopping, schools & parks all within walking distance. Sold for $454,000. Listed between $415,000-$430,000, this charming 2 bedroom,1 bath bungalow has been extensively updated throughout and is move-in ready! New exterior paint, new interior paint, newer carpet and tile, updated kitchen with stainless steel appliances, high-end solid surface countertops, and updated cabinetry. Remodeled bathroom with new vanity, mirror, and light fixture. Two car garage has been converted into a large family room/bonus room. Located within a quiet neighborhood, this home is truly a gem! Sold for $440,000. Large, private lot. This vintage Fallbrook ranch style charmer features quality details including original thin slat solid oak flooring, french doors, and big picture windows. Guest bath updated w/tile, cast iron claw foot tub & decorative fixtures. The master bath updated w/ walk-in tiled shower, radiant heated floor, & quartz countertop. Outdoor fireplace. Large paved patio adjoins the back of the home. Charming outdoor claw foot bath tub plumbed with hot and cold water. Garage. Automatic irrigation. Sold for $428,000. Highly desired end unit located in the triana community @ scripps ranch with low hoa fees ! Fha/va approved! Open floor plan and vaulted ceilings with a lot of natural light. Home features attached 1 car garage with laundry, outdoor patio,vaulted ceiling, wood floors, plantation shutters, new cabinets, granite counters, stainless steel appliances, breakfast bar and newer paint. Heating and a/c is 2 years new. Award winning dingman elementary is in walking distance.Sold for $425,086. Welcome Home! GREAT LOCATION AND PRICED TO SELL!! This beautiful home has 3 bedrooms, 2 bathrooms and 2 car garage. There is 1,170 sqft of open living space and sits on a huge 6,700 sqft lot!! Close to shopping and schools. No HOA! Don’t miss your chance to live in this desirable Escondido community. Sold for $420,000. Lovely light and bright Marina District loft style condo on the top floor! Spacious open concept interior, 14ft vaulted ceilings and no interior pillars to maximize space. Add a dividing wall and easily turn into a 1 bedroom! Large private balcony with peek views of downtown. Newly remodeled wood floors, granite countertops, washer dryer, floor to ceiling windows and sizable walk in closet. Secure Community offers gym, media center, meeting room, 2 rooftop lounges, gated parking, bike storage and security. Sold for $390,000. Beautiful & highly sought after, move in ready, single-story home with direct-access 2-car side-by-side garage. This home offers an open floor plan with a well appointed kitchen, solid wood flooring, & a custom wood sliding barn door! Other features include a laundry room, external storage closet, no stairs in unit & a cozy patio! The beautifully landscaped community of Treviso, features a pool, spa & clubhouse for your enjoyment. The low HOA dues are an added bonus at just $190 per month! VA Approved! Sold for $385,000. Don’t miss out on this rare Cape Concord beauty. This spacious 3 bed/2 bath comes with solar for reduced electrical bill, A/C, vaulted ceiling and a large master suite. The home features a spacious floor plan with family room/dinning room combo, and a nice flow into a functional kitchen. This home is perfect for families, or as a rental with a family friendly neighborhood and great community location. Cape Concord features a community pool and spa as well as open community space and rec room. Sold for $360,000. May’s San Diego real estate market in review: As of May 2017, the median detached home in San Diego County sold for $580,000, up 5.5% from the previous year. As of May 2017, the median attached home (including condos, townhomes, and twinhomes) in San Diego County sold for $385,000, up 7.2% from last year. 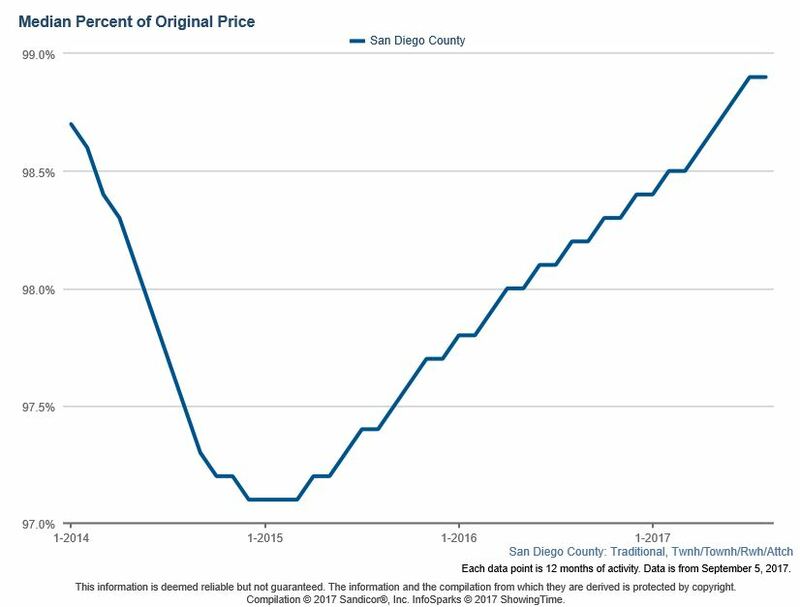 As of May 2017, the average seller of a detached home in San Diego County receives 98.1% of the original list price at the close of the sale. As of May 2017, the owners of attached properties (condos, twinhomes, and townhomes) retained 98.7% of the original list price. April’s San Diego real estate market in review: As of April 2017, the median detached home in San Diego County sold for $569,000, up 6.4% from the previous year. 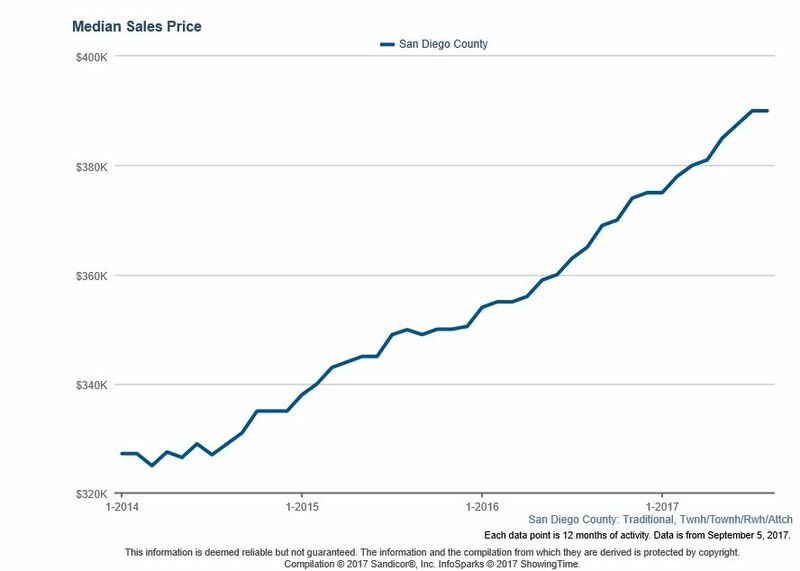 As of April 2017, the median attached home (including condos, townhomes, and twinhomes) in San Diego County sold for $377,000, up 7.7% from last year. The average detached home in San Diego spent 39 days on the market. As of April 2017, the average seller of a detached home in San Diego County receives 97% of the original list price at the close of the sale. As of April 2017, the owners of attached properties (condos, twinhomes, and townhomes) retained 97.9% of the original list price.